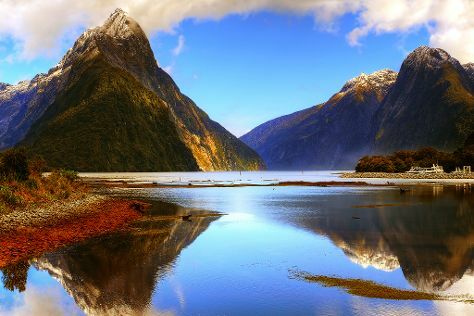 Far-flung New Zealand has become known for its astounding topography, singular biodiversity, varied climate, and for marrying native Māori and post-colonial European cultures on its two main islands and the multitude of smaller land masses dotted around them. Free-spirited New Zealanders have cultivated a love of sports, sustainability, and the outdoors. Far from other landmasses, the islands existed for millions of years before being inhabited by humans, so an abundance of species have come to thrive in the thick, wild rainforest, vast and rugged backland, and extensive surrounding marine areas. While much of New Zealand tourism centers around adventures through this spectacular scenery, take time to explore the nation's rich cultural heritage as well. The traditions and history of the Māoris, and the industry and internationalism of the descendents of the first European settlers endure in fascinating attractions, ranging from museums, to farms, to places of worship. North Island: Home to the national capital, its biggest city, and more than 75 percent of the country's population, North Island serves as the country's administrative hub, but also offers some highlights of New Zealand tourism, including volcanoes, hot springs, and beaches. South Island: Generally considered the more scenic and tourist-friendly of the country's two main regions, South Island abounds in picturesque mountain ranges, alpine lakes, verdant national parks, and dramatic fjords. Chatham Islands: An oft-overlooked corner of New Zealand sitting 680 km (423 mi) from the mainland, the remote Chatham Islands offer a chance to explore virtually untouched scenery in a region inhabited by only 600 people. Auckland: Any comprehensive trip to New Zealand should include Auckland, the nation's largest and most vibrant city, which sits at the tip of North Island and displays some of the nation's most impressive modern architecture. Wellington: Undersized Wellington may not look like a national capital, but its quaint charm and impressive surrounding scenery make it well worth a visit during your New Zealand holiday. Rotorua: You might not love the pervasive smell of sulfur dioxide that hangs over Rotorua, but even the nasal naysayers will be blown away by the volcanic city's array of geysers, hot springs, and bubbling mud pits. Queenstown: The undisputed hub of New Zealand tourism, Queenstown bustles with backpacker energy throughout the year; still, it's the incredible alpine scenery and the lure of winter skiing that keeps visitors coming back for more. Christchurch: Devastated by a series of earthquakes between 2010 and 2012, South Island's biggest city has begun to rebuild, and remains one of the best gateways to the country's southern attractions. Skyline Queenstown: Enjoy panoramic views over the city and the surrounding alpine landscape as you cruise downhill on your personal luge at one of the most popular attractions in New Zealand. Museum of New Zealand Te Papa Tongarewa: Get a taste of New Zealand's indigenous and postcolonial history at this modern museum, which also offers a fascinating and ever-changing collection of art. Sky Tower: Auckland's most distinctive tower soars to a height of 328 m (1,076 ft), featuring a viewing zone with panoramic vistas over the city, as well as three cafes and restaurants. Auckland Museum: The city's most distinctive museum serves first and foremost as a war memorial, but also features exhibits on indigenous culture and natural science, among others. Skyline Rotorua: Like its counterpart in Queenstown, this downhill luge ride offers scenic vistas over the volcanic fields of Rotorua and the nearby coast, with a gondola and a restaurant adding to the viewing opportunities. Huka Falls tracks: Hear the thundering roar of this distinctive cascade, which slopes gently before plummeting 11 m (36 ft) into the pool below. Wellington Cable Car: Enjoy the views from one of the highlights of New Zealand tourism: the country's only funicular railway, which runs between the hilltop suburb of Kelburn and the city's main quay. Waitangi Treaty Grounds: The site of the nation's most significant moment--the signing of the Treaty of Waitangi between British colonialists and Māori chiefs in 1840--this cultural landmark in the country's far north still holds an important place in many New Zealanders' hearts. Milford Sound: Nature doesn't come any more spectacular than this famous and accessible fjord, best viewed on a cruise across the calm water that surrounds it. Christchurch Botanic Gardens: Featuring an array of plant life from across New Zealand, these expansive gardens serve as a great spot for a relaxing stroll in the midst of diverse nature. The country's abundance of pristine nature means you'll have no shortage of child-friendly destinations to choose from during your New Zealand vacation. Chief among these, Queenstown offers excellent opportunities for skiing, sledding, and snow play during winter, with plenty of scenic views to enjoy in the warmer months. If they can get over the constant smell of rotten eggs, the little ones will also love Rotorua, a city whose bubbling mud pits and spurting geysers will spark their imagination and curiosity. All of the country's major cities are well-equipped to cater to young visitors, so your family trip to New Zealand will be a breeze. Incorporating the country's renowned nature into your New Zealand holiday will allow your kids to burn off their energy in a healthy, active way. Children will love Skyline Queenstown and Skyline Rotorua, where they can ride a self-directed luge down a winding track, enjoying the scenery as they go. The country's many wildlife reserves and zoos will also captivate little ones, who can enjoy the opportunity to get up close and personal with exotic animals. Take a breather and ascend to the viewing deck of Sky Tower, where your family can enjoy sweeping views over New Zealand's largest city. Renting a car is widely considered the best way to get from place to place on a New Zealand itinerary, and it makes even more sense if traveling as a family. Instead of buying four or five bus tickets every time you need to hit the road, you can save time and money by driving yourself, with the flexibility to stop off at the country's many natural highlights--such as Huka Falls tracks and Milford Sound--at your own pace. Consider staying at campgrounds or RV parks to let the kids mingle with others their own age, or make the most of New Zealand's good selection of family hotel rooms. One of the highlights of any tour of New Zealand is the range of delicious food on offer. The country's ethnic and cultural diversity means you can find cuisine from any corner of the globe in all major cities, with vegetarian options available at almost all restaurants. In terms of local food, seafood and lamb stand out as New Zealand's two most renowned products, both in terms of freshness and flavor. Don't miss the chance to try "hangi"--this traditional Māori-style barbecue can contain pork, chicken, and vegetables, and usually makes an appearance at special occasions and ceremonies. Despite the nation's relative isolation, you won't have any trouble finding the biggest international brands during your New Zealand vacation, with a range of malls, retailers, and open-air markets across the country. Take time to check out some of its fascinating independent shops, such as Pauanesia in Auckland and The Bead Shop in Queenstown. Keep an eye out for handmade souvenirs incorporating natural materials like New Zealand's excellent wool, wood, and gemstones, as well as those with special cultural significance for the Māori people. ●	Apart from a few species of bat, New Zealand has no native land mammals. However, the country abounds in iconic native birds and marine species, including the adorable kiwi. ●	More than a third of the country consists of national parks and marine protection zones. ●	Arguably New Zealand's biggest claim to fame is as the shooting location for the "Lord of the Rings" film trilogy. ●	New Zealand was the first country in the world to allow women to vote, way back in 1893. ●	Despite only having a population of around 4.5 million, New Zealand is historically the world's most successful nation in the rugby league. A New Zealand vacation is all about getting outdoors and enjoying the country's pristine nature, but too much time outside can come at a cost if you don't prepare properly. Don't go outside without sunscreen--even on seemingly overcast days--as New Zealand's depleted ozone layer means UV rays here can cause much more damage than in the northern hemisphere. You should also apply bug spray whenever you head out, to prevent painful bites from mosquitoes and sandflies. Despite the country's ethnic and religious diversity, Christian festivals remain the most common public holidays in New Zealand. Easter and Christmas stand out as the biggest holiday seasons, with each bringing roughly a week off from work for most New Zealanders. On February 6, the country observes Waitangi Day, which celebrates the signing of the famous founding document by the British and Māori people at Waitangi Treaty Grounds in 1840. ANZAC Day, on April 25, marks the fateful day in 1915 when thousands of New Zealand and Australian soldiers charged to their death at Gallipoli, in Turkey. During a summer trip to New Zealand, you can let loose at music festivals such as St. Jerome's Laneway Festival in Auckland, and the edgy WOMAD festival in New Plymouth. The people of New Zealand deservedly enjoy a reputation as some of the most relaxed in the world, and formality is unnecessary in most social situations. "Hi," "hey," or "g'day" will serve as an appropriate greeting in most circumstances, no matter the age or social status of the person in front of you. Show off your Māori language skills by saying "kia ora" (hello) to your friendly hosts. During a New Zealand holiday, you'll often be greeted with hugs and kisses on the cheek by friendly locals, although a handshake remains the standard for first meetings. New Zealand's combination of mountainous and coastal topography means that its climate varies from north to south, as well as from low to high altitude. For example, the average temperature between December and February hovers around a very pleasant 24 C (75 F) in northern, coastal Auckland, while in mountainous Queenstown you'll be able to enjoy a snowy winter (June through August), with temperatures hovering around freezing. The country's most unifying climatic feature is its rain; no matter where you go or what time of year you visit, bring waterproof clothing to protect against New Zealand's infamous wet weather. Unless you're specifically looking to take a skiing vacation to New Zealand, you'll probably find summer (December to February) the best time to visit, with warm, mostly sunny conditions that never get unbearably hot. For tourists embarking on a New Zealand holiday, there's no better way to explore the country than on four wheels. A competitive rental industry and relatively low gas prices mean you can rent a car--or even better, an RV--for several weeks and tour the country without breaking the bank. Don't worry about getting stranded between islands; you can take your car on a ferry between the two main islands, or simply pick a new one up on the other side. Just remember to stick to the left-hand side of the road. If you don't feel like driving, a well-connected network of intercity buses can take you from place to place. Decently priced flights between major cities serve as the quickest way to get around on your New Zealand vacation, but also rob you of the chance to enjoy the country's amazing roadside scenery. Tipping at restaurants, bars, and cafes is not compulsory nor expected in New Zealand, as wait staff work for a reasonable wage. For excellent service or food, however, a gratuity of 10 percent or more will be gratefully accepted. Taxi drivers do not expect a tip, but most will graciously accept your offer, while hotel staff may hang around for a small tip of a few dollars after carrying your bag. New Zealand tour guides often expect a tip for a job well done, though staff at the country's many hot springs and spas don't usually work for tips.